These are the cards that my in-color club girls got with their order this month! I hand cut the vase from the solid image in Priceless. p.s. I updated my side photo a few days ago. 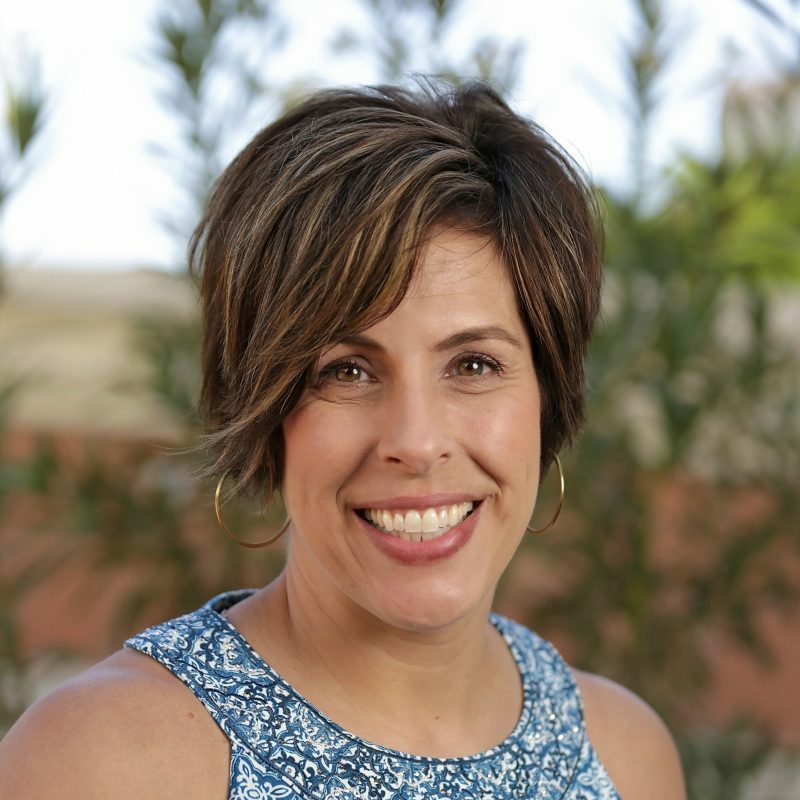 This picture was taken of me at the Stampin’ Up! leadership conference in January. What to do when you …. … loose your creativity?? Well, I sit down to copy a card. 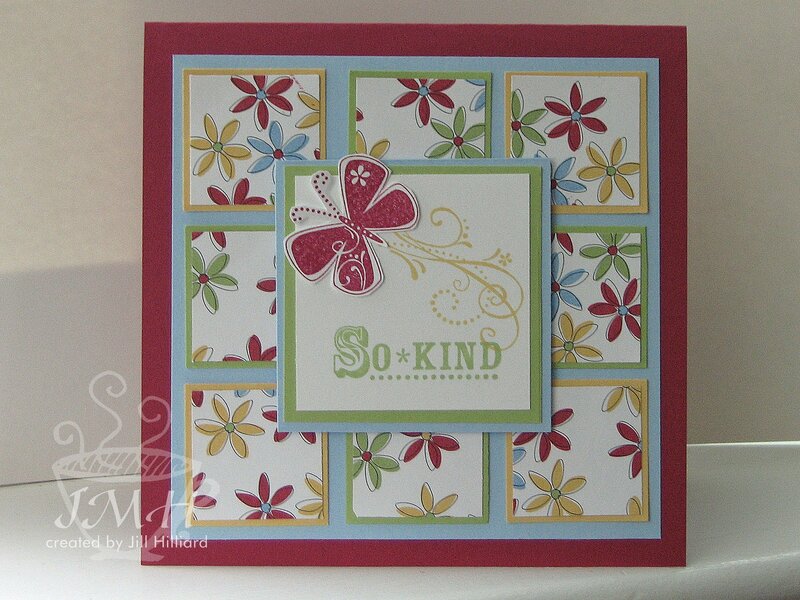 Have you seen this beauty from Sharon over at no time to stamp? Beautiful. So I re-created it using Stampin’ Up products. This 1st card is the almost exact case. 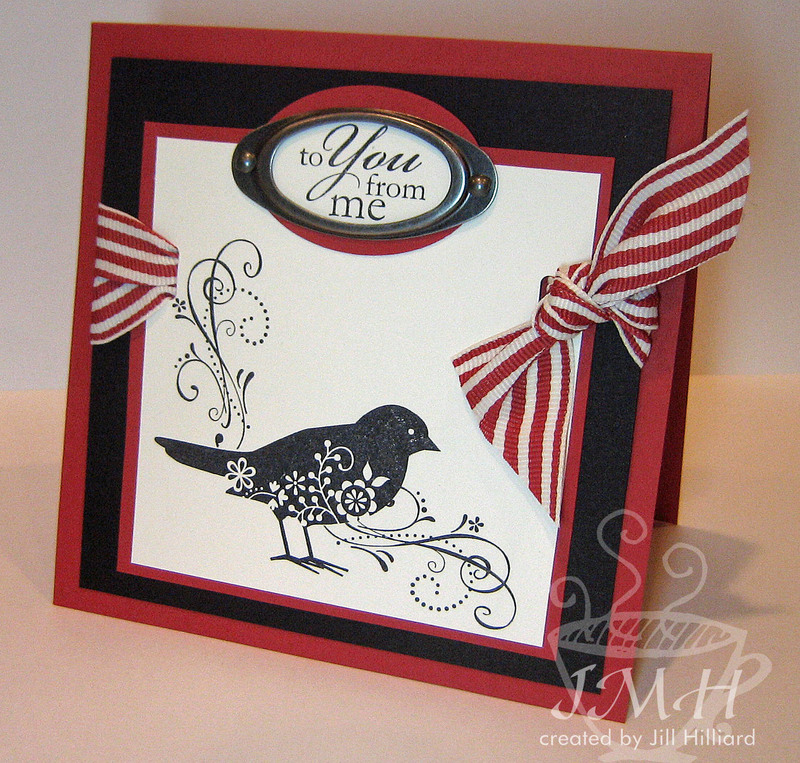 This card was me moving things around a little since I stamped the bird down to low to have the sentiment in the same place as Sharon’s card. card measures 5.25 square. Let me know if you like it. Inspired by a gift bag in the new Papercrafts Magazine( June/July issue, page 26)- silhouettes on a background. I thought I would try stamping the silhouette image onto designer paper. I love the effect and the simplicity of this. I hand drew the ground she is standing on with a chocolate chip marker and the swirls are from the set Priceless. I also separated the words from the stamped image before mounting them on the blocks. Paper: Chocolate chip and white cardstock. Pink designer paper from CTMH. 3 Pocket note card holder-Cased! OMG- You have to see Patty Bennett’s blog with these adorable pocket note card holders. To Stinkin Cute! Here was my 1st attempt at casing. 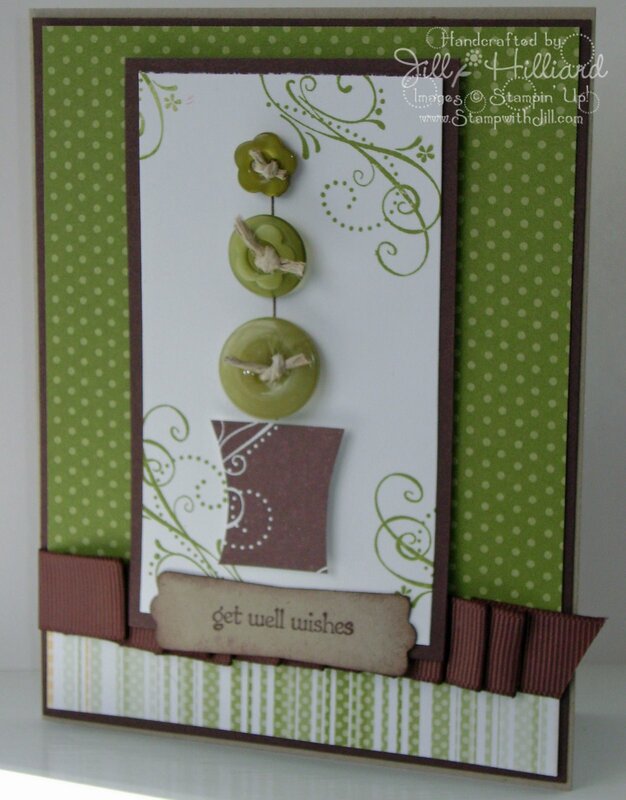 I Used K& Co Wild Saffron Paper (from the stack) and Stampin Up Sage Shadow. I used this paper because I was afraid to mess up a full sheet of my SU paper! LOL. If this ended in the trash- I would not care! The Stampin Up version is further down in the post! How I made Mine. NOTE: I am not sure how Patty made hers– but this is my look at the picture and fake it version. Thanks Patty! This was way fun, and a challenge to figure it out! I hope you don’t mind me sharing with my readers your fabulous project. I used 2 Sheets of double sided paper(save your scraps! ), 2 sheets of Sage Shadow card stock (save your scraps here too!) and some scrap very vanilla paper and embellishments. The Envelopes are the SU small note cards that measure about 3×5. Cut the 1st sheet of DP 6×12 and score at 4.5″ and 9″, fold to make the base of the holder. from the 2nd piece of 6×12, cut 3 strips in the following sizes: 2.5″ x 6″, 2.5″ x 6″ and 1.5″ x 6″ attach these to the base with glue on 3 sides to make the pocket. You can use Sticky strip– but I used the liquid Mono Multi- a very thin line/strip very close to the edge. That stuff holds GREAT! My card base is 5×7 folded to 3×5. This is the same size as the Stampin Up small note cards that Patty used in her version. I prefer colored cards and I have quite a few of these sized envelopes on hand. The belly band is the scrap (1.5 x11) from one of the sheets of card stock after it was trimmed to make the smaller card size. 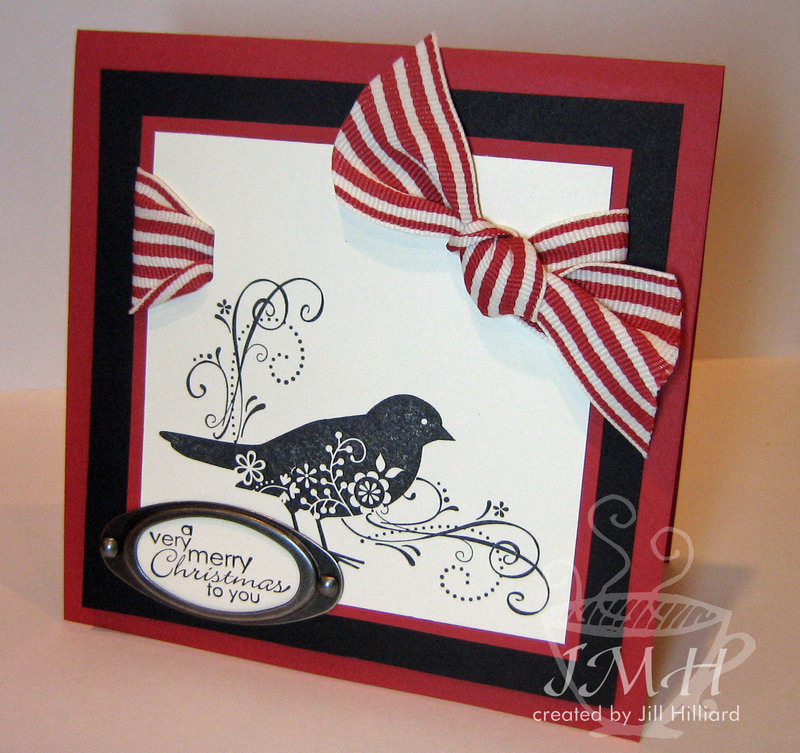 The rest is decorating – the 2nd piece of designer paper was used for the card fronts. Lovely Labels is the stamp set. The flower is from the pretties kit, died right on the sage shadow ink pad. Top pocket is for stamps (none shown in my pictures), next pocket is for the cards and the 3rd pocket is for the Envelopes. This can hold 4 lightly Embellished cards and envelopes. the pockets are pretty tight. This version I used flat note cards, which means they are like a piece of stationary that does not fold. Perfect for a quick note. These fit very well in the holder. Here I used Summer Picnic paper, Bashful blue and old olive. Because there is no designer paper on these flat note cards I was able to make this whole set from 1 sheet of summer picnic 12×12 paper and 1 sheet of bashful blue and 1 sheet of whisper white. the embellishments and the belly band came from scraps in the drawer. What great gifts these will make. We do a lot of teacher gifts at the end of the year. These whip up in under 1 hour!!!!!! Want this as a class? Leave a comment or send me an email. If I get enough requests, I can fit this into the schedule! Enjoy! Each participant will make these 4 cards (with envelopes) and the card tin. The A Little Bird Told Me set is a collection of Thank you notes. Each of these cards is made with the designer series prints paper and the Stampin’ Up! small note cards with envelopes. The prints paper is double sided so you will have some choices in your patterns and some of the patterns will vary from what is shown in the picture. The colors are Certainly Celery, Rose Red and So Saffron for the Birdie Thank you collection. The Priceless set is a collection of Valentine and Love notes. These are also made with the designer series prints paper and the colors are Purely Pomegranate, Soft Sky and Blue Bayou. The note cards and envelopes fit in the tin and make a great gift. I will be offering a “Class by Mail” option if you can not make it or if you do not live close by. All materials will be precut, prestamped and ready to assemble. Full color instructions, with pictures will be provided to show you how to make the cards. You will need your own adhesive. The only additional cost is the $4.60 priority shipping. To register for this class, arrange alternate payment options, let me know your color selection or order your stamp set, please Email Me or click here . 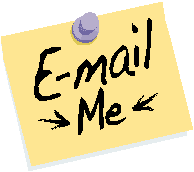 Do you have a special request- Just let me know. I have only 7 spots left to this class. I hope to hear from you soon! I have had these 2 note card boxes from Target for a very Long time. My friend Kim gave me one of these – I am not sure where I got the other- probably Target! Needless to say, I have finally altered them and I used them as gifts this holiday season. The Stampin’ Up! Small note cards and Envelopes fit right inside these boxes. I saved the note cards for something else, and used the envelopes for these. The envelopes are 5 1/8 by 3 5/8. 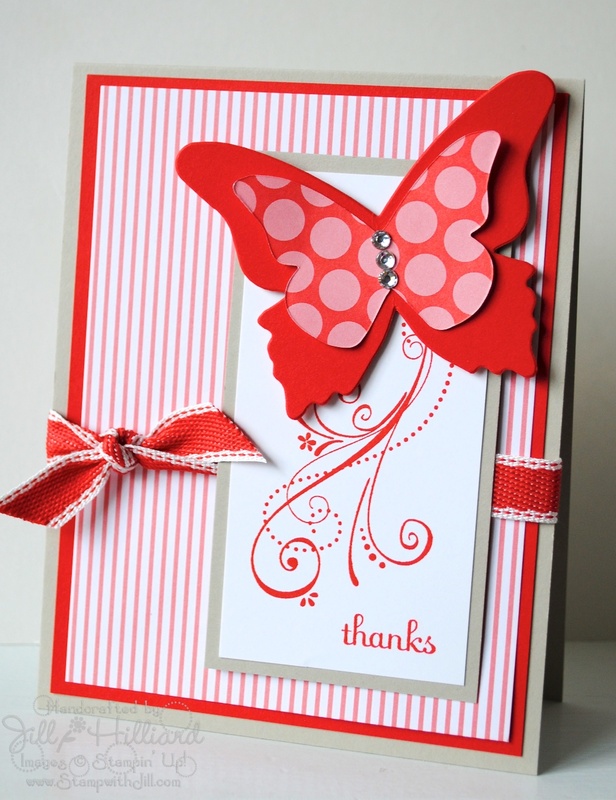 I cut card stock cut to the same size as the note cards and created these adorable Thank You note sets. I also used up some retired paper that was being neglected. Every one needs Thank You notes this time of year.